David Patrón serves as the Practice Coordinator of the firm’s New Orleans Litigation Group where he manages one of the firm’s largest practice groups. 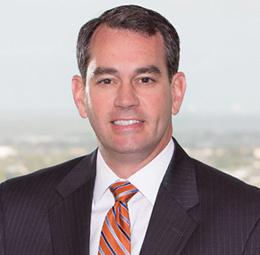 With more than 20 years of legal experience, Mr. Patrón has established a solid reputation as a talented litigator who successfully represents businesses at all phases of litigation in state and federal courts throughout the Gulf South and beyond. Whether winning at trial or negotiating favorable settlements, he is a results-oriented lawyer whose legal successes have been recognized in several media outlets. For more than a decade, Mr. Patrón also has taught negotiation and advocacy as a law school adjunct faculty professor to more than a thousand law students, and he applies this experience in both courtrooms and boardrooms. With a strong background in commercial litigation and deep experience in the energy sector, Mr. Patrón provides counsel to clients on a wide variety of complex legal issues, including antitrust and trade regulation, intellectual property, and employment law. Whether defending a breach of contract or prosecuting a breach of fiduciary duty, Mr. Patrón focuses on finding real world business solutions for his clients. Mr. Patrón regularly counsels and represents clients in the energy sector, including publicly traded exploration and production companies with domestic and international operations. For more than a decade, he has acted as the primary counsel for an oil and gas company that consistently ranks as a top producer in the State of Louisiana. Mr. Patrón also actively represents several oilfield services companies specializing in drilling, pressure control, snubbing, nitrogen and fluid pumping, wireline, barge and towing services, offshore catering, hydraulic fracturing, and well control. He handles a variety of litigation matters affecting the energy sector, including disputes with lessors, royalty owners, contractors, operators, and regulators. His experience includes a host of government and regulatory issues affecting the oil and gas industry, including coastal use permitting, environmental regulations, severance taxes, oilfield legacy litigation, royalty disputes, criminal investigations, and lease disputes. He represents energy clients before the Department of Revenue, Department of Wildlife and Fisheries, Department of Natural Resources, Department of Environmental Quality, State Mineral Board, Environmental Protection Agency, and Department of Justice. Mr. Patrón also represents corporate clients on a variety of intellectual property and technology issues including trade secrets, copyright and trademark law, software rights and licensing, confidentiality and non-competition agreements, e-commerce and internet use, cybersquatting, and unfair trade practices. Mr. Patrón litigates intellectual property cases on a regular basis and frequently works with the Patent and Trademark Office to secure various registrations for emerging companies. He represents clients in the sale of intellectual property and the use of trademarks and copyrighted materials on websites. He reviews, drafts, negotiates, and litigates software licensing agreements and counsels clients regarding business systems designed to protect trade secrets. Mr. Patrón is the former chairman of the Intellectual Property Law Committee of the Louisiana State Bar Association and remains active in the IP committees of New Orleans and Louisiana Bar Associations. He is a frequent speaker on a wide variety of intellectual property topics, and the media regularly seeks his legal analysis regarding intellectual property issues. Mr. Patrón has substantial experience in antitrust and trade regulation. At Stanford Law School, he studied antitrust and trade regulation under the former United States Attorney General of the Antitrust Division of the Department of Justice. Since then, he has defended and prosecuted antitrust claims on behalf of clients at the trial and appellate levels, has prepared amicus briefs on antitrust issues, and has monitored antitrust litigation, legislation, and guidelines on behalf of interested clients. Outside of the courtroom, Mr. Patrón has defended clients being investigated by federal antitrust regulators, has designed an Antitrust Compliance Manual for businesses, and has published articles on antitrust law developments. He has also counseled trade associations and practice groups on various antitrust issues, including information sharing, price-fixing, and state-action immunity. In addition to his legal practice, Mr. Patrón serves on the firm’s eDiscovery Team and helps guide the firm’s efforts to ensure that our lawyers are on the cutting edge of the evolving legislative and jurisprudential rules which govern electronic discovery and have the best tools available to efficiently collect, review and produce electronic data for the firm’s clients. The eDiscovery Team also works with clients to develop strategies for electronic data organization, retention and collection – both before and during litigation – so they are prepared to actively avoid, pursue or defend disputes in the most efficient way possible. Mr. Patrón has published several articles concerning developments in antitrust, trade regulation, intellectual property and commercial litigation. He has drafted several papers and moderated a series of American Bar Association roundtable discussions on a variety of legal topics and has appeared as a legal commentator on WDSU-TV, WGNO-TV and WVUE-TV to discuss various government and court actions. Prevailing on motion to dismiss representing a Fortune 50 company against claims by heirs of a former owner of the Barq's root beer brand who asserted a 100% ownership of Coca-Cola’s Barq’s brand: The case involved legal issues of first impression under Louisiana law, and the plaintiffs were seeking in excess of $92 million in damages from Coca-Cola. Mr. Patrón was lead trial counsel and, as a result of his work, the case was dismissed before any discovery. Mr. Patrón also prevailed on the plaintiff’s appeal to the Fifth Circuit. The legal victories at both the trial and appellate levels were covered extensively in several media outlets, including Law360, New Orleans CityBusiness, The Times Picayune, WWL TV, and Yahoo News. Representing a Fortune 50 company in all labor and employment litigation in Louisiana: Over the course of a decade, Mr. Patrón has handled numerous cases for the national drugstore chain CVS throughout the State. Successfully defending a regional equipment distributor against claims of trade secret misappropriation, fraud, and unfair trade practices by competing distributor: Mr. Patrón’s client was sued after it hired a salesperson from a competing company. The competitor alleged that the salesperson downloaded confidential information and trade secrets, including customer lists, pricing information, and contract terms. After successfully handling the hearings for a temporary restraining order and preliminary injunction, Mr. Patrón worked with computer forensic experts to quickly resolve the case without his client making any payments for damages. Prevailing at trial in representation of an oilfield pressure control company defending trade secret misappropriation claims in Texas state court: After six year of litigation, Mr. Patrón was lead counsel for a month-long trial where plaintiff sought over $200 million in compensatory and punitive damages in closing arguments. The jury returned complete defense verdict, completely absolving Mr. Patrón’s client of all claims. Mr. Patrón also defeated all of plaintiff’s post-trial motions. The trial was covered and reported in VerdictSearch. Representing an international oilfield drilling service provider in a $35 million lawsuit in Texas: The lawsuit alleges an energy company underfunded a joint venture to refurbish an oil rig in Singapore to be used off the coast of Alaska, causing the deal to fail. Mr. Patrón is lead trial counsel and the lawsuit he filed has been extensively covered in numerous publications, including Law360, Petroleum News, The Alaska Journal of Commerce, and The Homer Tribune. Successfully defending an energy service company in litigation spanning a period of five years regarding the failed acquisition of oilfield rental tool company: The lawsuit involved complex allegations of negligent misrepresentation, fraud, and breach of contract with damages in excess of $10 million. Mr. Patrón engaged in extensive discovery including depositions of high level energy executives and issues of forensic accounting and business valuation. The case settled under very terms and for a fraction of liability exposure after Mr. Patrón filed a motion of summary judgment and a motion to disqualify plaintiff’s expert. Currently representing current mineral lease operator to defend environmental claims stemming from oilfield legacy litigation: The lawsuit involves evolving theories of liability under the Mineral Code, lease provisions, and tort law. Currently representing a publicly traded exploration and production company in multiple severance tax lawsuits filed by the Department of Revenue: The cases involves valuation of oil and gas at time of severance and interpretation of complex regulatory statutes. The client has domestic and international oil and gas operations and consistently ranks as a top oil producer in the State of Louisiana. Currently defending multiple lawsuits by the Department of Wildlife and Fisheries against energy clients: The cases involve alleged impacts to public oyster seed grounds due to coastal use permit activities. Mr. Patrón prevailed on a motion to dismiss, which was affirmed in part on appeal. Successfully defending an international Fortune 100 computer technology manufacturer in a trademark dilution suit in connection with a global advertising campaign: Charged with the responsibility of overseeing the day-to-day management of this case which involved representing Hewlett-Packard in a lawsuit filed by the Louisiana Superdome. The case was dismissed against HP without any settlement payment. Prosecuting action for trademark infringement, dilution, unfair competition, and unjust enrichment for a national restaurant chain against a competing restaurant group: The defendant paid Mr. Patrón’s client a substantial cash settlement and changed the name of its restaurant in lieu of going to trial. Successfully defending an international beverage company against claims of copyright infringement in connection with a national television advertising campaign involving Magic Johnson: Mr. Patrón handled all aspects of this case which involved representing Miller Brewing and taking the depositions of the lead guitarist for the Saturday Night Live band and Hall of Fame basketball player Magic Johnson in Beverly Hills. Prevailing at trial in defending action for copyright infringement against Cash Money Records for artist Juvenile’s song “Back That Azz Up”: After a two-week federal trial, the jury returned a defense verdict after plaintiffs sought over $50 million. The jury verdict was upheld on appeal to Fifth Circuit, and the case was widely covered in the national media. Successfully defended a national recording label in a copyright lawsuit over uploading copyrighted material to a MySpace page of the artist Lil’ Wayne: Case was dismissed against the Universal defendants we represented without any payment of settlement monies. Successfully defending a New York-based paint manufacturer against claims of unfair competition and trademark infringement: Mr. Patrón was in charge of the day-to-day management of the case, which ultimately settled without any money being paid by the client. Handing the appeal for a national computer software company that retained Phelps Dunbar after having lost a two-week trial with former counsel: The appeal involved highly technical claims of copyright infringement of computer software, trade secret misappropriation, and breach of contract. After briefs were filed, one of the appellees paid Phelps' client to settle the matter before the case was heard by the Fifth Circuit. Seizing over 5,000 illegally-copied videotapes on behalf an international entertainment company: Mr. Patrón handled all aspects of the case and secured permanent injunctions and final judgments for copyright infringement claims and violations of film licensing agreements. Successfully prosecuting claims of trademark dilution, infringement, and cybersquatting on behalf of a national recording label: Mr. Patrón won the case on summary judgment against businesses and individuals who misappropriated his client’s trademarks. Speaker at Intellectual Property Breakfast Briefing series on copyright and trademark law.